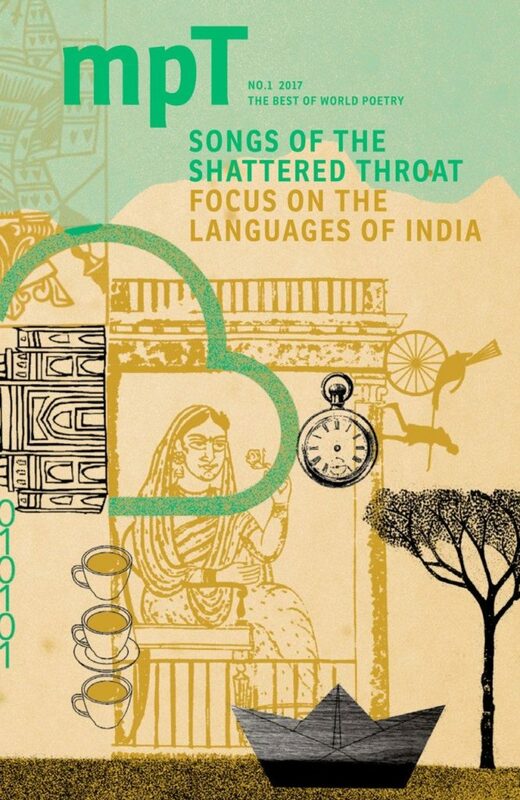 MPT’s new issue ‘Songs of the Shattered Throat’ focuses on poetry in the languages of India, with a selection of new translations of Tulsidas, Monika Kumar, Kutti Revathi, Joy Goswami, Vinod Kumar Shukla and Anitha Thampi, whose poem is published in partnership with Indian Quarterly. The issue also features new work by Ed Doegar, Daljit Nagra and Siddhartha Bose. The translations are accompanied by an essay by prominent Hindi novelist and poet Geet Chaturvedi about the status of Hindi as a literary language and English language’s corrosive effect on Hindi literary culture. ‘Songs of the Shattered Throat’ also includes selections of poems by Swedish modernist Ann Jäderlund, Lea Goldberg’s exquisite sequence ‘Songs of Spain’, published in English translation for the first time, Bernard O’Donoghue’s new translation of Piers Plowman and a collaborative translation between UK poet Karen McCarthy Woolf and Turkish poet Nurduran Duman. All in this new issue of the groundbreaking magazine dedicated to poetry in translation: for the best in world poetry read MPT.